EMBRACING THE CALLING: Albert Khoza speaks candidly about his gift. WITSIE Puleng Khwezikazi Khuthala Mthethwa had a take-home exam in November last year. She did her work as required but when the time came to print her assignment something strange kept happening. She clicked on the “print” icon and her assignment printed but it had someone else’s name at the top instead of hers. She knew this was strange but assumed it was just a technical fault. She tried again. Yet again the assignment was printed. This time a different name appeared at the top of the page but it still wasn’t her own. Mthethwa tried over and over again and the same thing happened, each time a different name. Mthethwa broke down, right at the computer labs. She didn’t understand what was happening. She went home and showed the papers to her aunt who told her that each name was an ancestor’s name. Albert Silindokuhle Ibokwe Khoza was in his drama class as usual. During rehearsals, he started seeing people. He saw people who were not there, people who were not part of his class. He also started hearing things that other people couldn’t hear. “I could snap into a trance and be stuck in that position for a very long time,” explained Khoza. He knew all of this meant that he had been called. Mthethwa and Khoza are two students who are facing a transition in their lives that they feel no one at Wits understands or supports. The “traditional calling” is a process of answering one’s ancestors and learning how to use the gift the “called” have been given. Khoza’s twin sister had the calling first which made it easier for him to come to terms with it. Both Mthethwa and Khoza explained that people have different callings and that they were guided by their amadlozi (ancestors) to understand what their unique gift was. “There are different types of callings. You get people that see. You get people that when they speak, their word becomes flesh. You get people that smell and are able to interpret what that smell will lead to,” Mthethwa said. 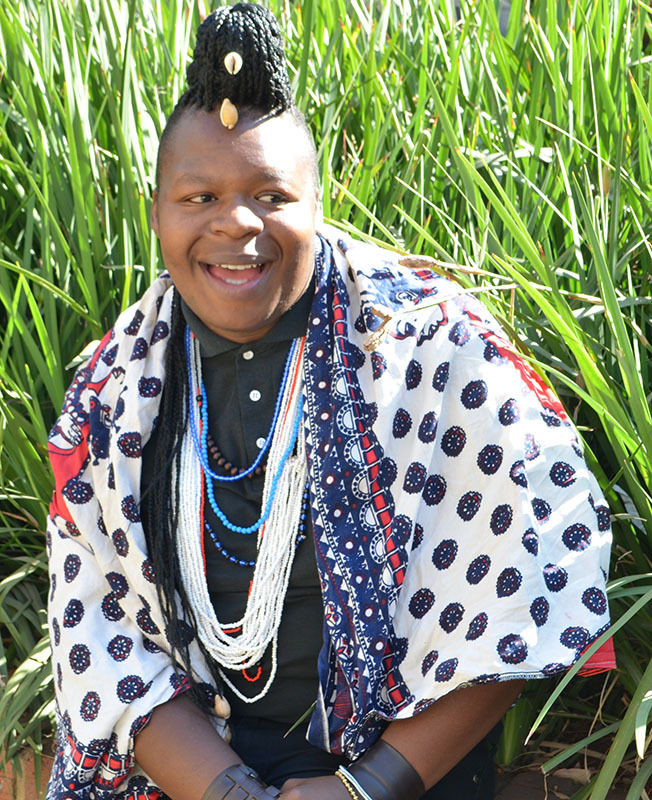 Khoza, who was dressed in his traditional cloth, and often wears beads and a braided mohawk, said people often judged him for who he is. Mthethwa said she had been called many names. Mthethwa describes herself as a hybrid human being, stuck between two worlds – the material and spiritual. “It’s difficult to explain what you are going through to people when you yourself have not come to grips with what it is,” said a visibly frustrated Mthethwa. Khoza and Mthethwa said they were concerned that there are no formal structures at Wits to help with what they are going through. “What support do they offer for people like me who have the calling? That’s the struggle I face the most,” a disheartened Mthethwa said. Khoza said the main issue was that they are going through an African phenomenon in an institution governed by western principles. “They are white and then there are those who are black who have Christian beliefs and therefore this is not in line with their beliefs so they don’t take it seriously,” he said. Mthethwa said she had been to Dean of Humanities Ruksana Osman who told her that many students had come to her with the issue of the calling and been excluded because of it. Khoza said there had been incidents at the drama department where people had psychological breakdowns and no one knew what they were going through. He said when it was discovered that they had the calling, they simply left their studies. These students expressed their concern that they had to present doctor notes from western doctors when they had fallen ill or had to consult with a sangoma. They complained that while people who had depression or difficulties studying could go to the Counselling and Careers Development Unit (CCDU), students who had the calling had nowhere to go. Charmy Naidoo of the CCDU told Wits Vuvuzela she was not sure if there were specific people at CCDU students with the calling could come to for support.